The whole world is watching – and praying – that Japanese technicians can surmount the threat of melt-down at the earthquake-affected Fukushima Daiichi nuclear plants. But even if the reactors are shutdown safely in the next few hours, the damage to the reputation of the worldwide nuclear industry is going to be felt for years to come. With Chernobyl ‘retired’ to the history of the last century, the advocates of nuclear generated electricity appeared to be winning the argument especially in the fast-expanding economies of the East. With Japan as its example, countries such as China and India, which also own little oil, have ambitious nuclear expansion plans. Inevitably these programmes will attract bad publicity in the wake of Fukushima but are unlikely to be revised given they have no viable alternative to nuclear power. It is in those countries where the debate still rages about the advantages of nuclear power plants – the US, UK, France, Germany, and Switzerland for example – versus alternative sources of electrical generation, that the anti-nuclear lobby have been handed an advantage by Japan’s woes. I had long come to the conclusion that Britain would never be able to produce enough renewable energy from wind, tidal, and solar sources in time to avoid building a new generation of nuclear power stations adjacent to existing sites. As a business journalist I wrote that the main concern about nuclear generators was the safe disposal of spent radioactive material. Now I’m not so sure. The Fukushima disaster has revealed the vulnerability of its reactors’ cooling systems. 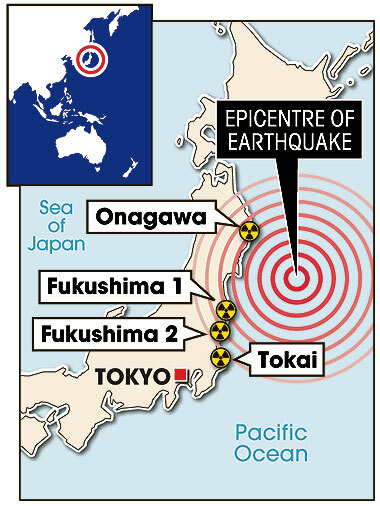 The Japanese people were told the plants had been tailor-made for the region. There may be other weaknesses, which it is possible the scientists haven't given full weight too either. Thankfully Britain isn’t in an earthquake zone but it isn’t too fanciful to think of scenarios where a nuclear plant comes under attack by an Act of God or man. The supporters of nuclear power must make their case all over again. What are the viable alternaties to nuclear power? I wonder how many people are dying directly and indirectly with the mining, drilling and use of other fuels. Coal, oil and gas come readily to mind.